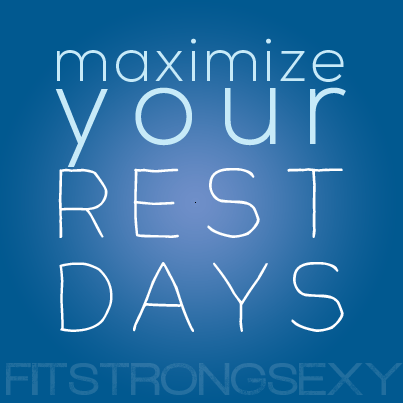 One thing many people neglect when starting off in a fitness regiment is learning how to rest and recover properly. For starters, some people don’t rest at all. I see people especially on social media talking about “NO DAYS OFF” and things like that…and to that I say, have fun getting injured! No, seriously- if you DON’T ever take a rest day, you will get injured, simple as that. Also, honestly, if you feel like you don’t ever even need a rest day, you may need to up the intensity on your workouts! Because I tell you what, after doing 5 sets of 5 squats and bench at 80% of my max weight, I AM BEAT. And the rest day afterwards is so essential. Over time I’ve learned a few tips and tricks that have helped me me able to maintain my muscle and recover so that I can hit the next workout hard without injury. PAY ATTENTION TO NUTRITION. Just because you’re not working out doesn’t mean you should cut calories by skipping meals, or on the other side of the spectrum- overeat. Keep your balanced portions of proteins, carbs, and healthy fats just like you would on normal workout days. Actually, I find that my metabolism cranks up on my rest days even more than the days I actually DO workout! On your rest days, your muscles are being rebuilt so it’s crucial to feed them with yummy, healthy, clean food! And make sure you get adequate protein- it’s the most essential muscle building nutrient. STRETCH. Like most people, my muscles can be pretty tight the next day after a grueling workout, so I like to get some good stretching in. Honestly, yoga is one of my favorite ways to stretch and it really helps in retaining my flexibility and fluidity. I HIGHLY recommend the Yoga Studio App- I use it all the time and it creates really high-quality yoga workouts for all levels! You can even create your own using their pose library. It’s definitely worth a try! FOAM ROLL/MASSAGE. As much as I’d love to get a professional sports massage monthly, it’s not exactly affordable. The alternative? Foam rolling! While it doesn’t look like much, using a foam roll is an excellent way to relieve muscle tension. (Here’s a great guide on how to use it. )The greatest part is that foam rollers are pretty cheap generally. Other devices I use to massage muscles include tennis balls and golf balls (just roll on them on the ground or prop them up on the wall and stand up!) and the Theracane. The Theracane is especially great if you suffer from lots of deep, little knots in your back like I do. SUPPLEMENT ACCORDINGLY. Magnesium is an excellent supplement to take to help with muscle recovery and cramping, and is something I take frequently! A good daily multivitamin and Omega 3 supplement is also amazing for general upkeep and to keep your body in tip-top shape!So those are my BEST tips for recovery! Is there anything you like to do that helps you in particular? Comment below!